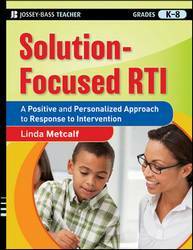 Solution-Focused RTI provides an effective approach to Response-to-Intervention using a "solution-focused" method, which emphasizes a student's strengths rather than his or her weaknesses. This important book guides educators to identify exceptions to students' learning problems and design personalized interventions that can help those students succeed. In this book Linda Metcalf provides school counselors with the basic building blocks of the solution-focused approach and offers step-by-step guidelines for identifying exceptions, designing interventions, and implementing a three-tiered Response-to-Intervention process.